Agia Marina, 10km east of Chania, is a package holiday town. There’s very little of Crete in evidence here. The town could be in Mallorca or the Canary Islands, and there would be very little to register this fact. This town’s only business is tourism, tourism, tourism. Hotels, restaurants, bars, shops and nightclubs lie side by side all over. Agia Marina’s beach is ok, but far too overcrowded in the summer. Finding a room here isn’t too difficult out of season, but the prices are higher than other places in Crete. 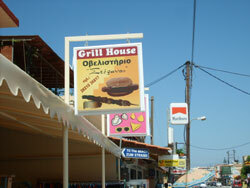 Most restaurants offer international food (pizza, burgers, chips...), though the odd Cretan dish makes it to some menus. Agia Marina is mostly visited by Scandinavians, Brits and Germans. Communication is easy, since almost everyone speaks English and German. 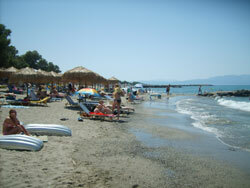 Agia Marina is a place to go for the package deal; a nice beach and plenty of sun. 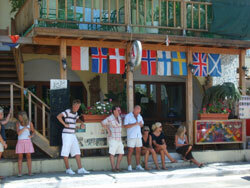 If you’re young and looking for the big party, Malia (near Iraklio) is far more suited to your tastes. 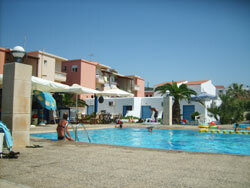 Agia Marina is for couples and families. It’s not a bad base to explore the west of Crete, either by bus or car. The bus connections in the saison 2019 will be fabulous – there’s in summer a bus every 20 minutes to Chania and the neighbouring towns of Platanias and Kolymbari. You should buy tickets at a kiosk beforehand, but it’s also often possible to buy tickets on the bus, even if the signs at the bus stop tell you otherwise.